Happening this week: Mercury is retrograde in Cancer now. On Monday Saturn goes direct in Libra and we’ll enjoy a New Moon in Cancer). On Saturday Mars joins the party in Cancer with the Sun, Mercury and Jupiter. Aries: You can’t always plan your life. Unexpected experiences happen with surprise and can be dramatic. This week love is so important in your life. Love that is heartfelt, emotional and meaningful. This is love of a higher vibration. Some people, and especially pets, are a part of our lives teaching us in unexpected ways what unconditional love really is. If you were to weigh your heart against the weight of a feather, how light would your heart be? The light shines in your heart as you come to understand that life is part of a larger plan of love. Taurus: You embody an understanding now that your blessings are often in disguise. Through some of the most challenging parts of life, awakening happens that brings you closer to realizing the real purpose of life is to be open and honest, from the heart. You feel closer to others this week when you understand the commonality of life’s lessons we all go through that ultimately bring us into alignment with a higher consciousness. Understanding why things happen as they do is not always yours to know, but through the mystery you get an internal glimpse of eternity. A million light years is only a flash between your heart and soul. The message of truth reaches your spirit and this bond is unbreakable. Gemini: It’s a good time for you to revisit your sense of belonging in the world. This a time to get more grounded. Where does your core feel most capable of standing on solid ground? It’s not necessary to answer this question in words now, but through becoming more attuned to your feelings. When you feel confidently embodied in your stance, you will then have power to move in any direction. This week, take the time to build up your ego in a healthy way so you awaken an abundance in the core of your being. This will set the stage for creating a new you that attracts more of what you deserve in life. Focus your actions and intentions on growth and renewal. Cancer: The dawn destroys the night, and that is a beautiful thing. Life reawakens, the light of the sun shines. This is symbolic of the transformation you are going through now. You are experiencing an ending in life, but it is a change for the better. The light shines in your heart now as you release a part of life that welcomes you to a new beginning. Though you can’t always understand the purpose behind the experience logically, your heart knows there is a higher reason for this transformation. Your soul needs this change, so welcome it with gratitude and love. Leo: Life isn’t always meant to be so serious. You know that, you’re a Leo! Your best intentions may be tempered with a dose of reality now, but you’re encouraged to still let yourself shine freely. You’re going to be given a chance to feel exhilarated and inspired on a soul level this week. Let the love of beauty and light in life guide you. If you feel restrained or heavy in any way, put on your sparklers and blare music to flush out the energy and shift your attitude to come back on track. Renewal comes through spontaneity now. Time spent in the sunlight and in the hours of a crescent moon later in the week boosts your spirits. Picking up an artistic pursuit on the spur of the moment refreshes the meaning of life. Skydive into your philosophical worldview with a jet pack. Virgo: Usually Virgos can’t stand loose ends. This is a good week to tidy them up. You may feel like you want to pursue your future now, but it’s best to wait. Past, present and future are all connected of course, so don’t worry about not reaching forward with anticipation just yet. At least you can set the stage by reorganizing and reassessing what’s been needing your attention. Though making concrete plans for the future won’t be the best use of your time now, you can collect a slew of inventive ideas now by looking back on what worked and didn’t work in the past. You’ll likely get bursts of excitement knowing that getting things together now is putting you in a better place to allow abundance to come into your life. Focus on developing a stronger sense of independent will this week that will help you climb later. Libra: You know people love you. At least you should. This week you’ll experience the importance of building bridges and the benefits in softening your ego a bit. You can still be proud of who you are, but also let others feel proud to be themselves too. Though you’ll feel inspired to do your own thing, others will also recognize the value in who you are when you’re showing an interest in genuine camaraderie. The feeling will be mutual when you’re on the right track. You may be rethinking some aspect of your career. New potential arrives that gives you a positive outlook. Expect the best and it will make life easier. Scorpio: Realize that any challenges that may arise this week are really blessings in disguise. If you let your intuition guide you, the blessings will become much more obvious. If you are holding on to any fears, this week is a good time to reassess how valid and true they really are, or if they are just illusions you are addicted to. You’ll learn about the meaning of your life this week when you put your thinking cap on inside out. Let go of old patterns of thinking that don’t really serve you best so you can reassess your life with optimism and renewal. The sun is shining on your ruling planet so you can wake up and look towards the light and remember its purpose in your life. Sagittarius: Everybody has secrets, and each of us has a reason for keeping them. Not all secrets are about hiding something out of shame, guilt or worry of course. Sometimes they are a little piece of magic in our lives we hold on to that are especially ours. We know though that in the grand scheme of things all our thoughts and words are known to the universe. You’ve got something important that feels personal and is between only you and the cosmos. Inside you is an entire world. You’re reminded of how special we all are in our own way when you see that light inside of you is also in others. We’re all connected in a web of unfolding destiny some call Wyrd. Capricorn: Your ruling planet is in such an auspicious position now, and you’ve got the Sun staring at you. Saturn goes direct on Monday. You’re important in the lives of others now, so use your life. If you’ve got life in you then no matter what your age you should be doing something that you desire to do. Though father time stops for no one, you’ve got beautiful ideas that need to be shared. This week let’s you remember what you’re worth to yourself and to others. It’s important that this abundant energy you have is not used to overpower others as a dominant figure though. You create healthy bonds when you find a balance between your energy and the needs of others. The symbolism of water and earth is really important for you to acknowledge and experience now. Aquarius: You may feel like you need to work a little harder to be heard now. Your voice is a messenger that is powerful, so use it wisely. Saying what you feel is important, but it’s also important to consider how others will feel when you speak up. If you catch someone off guard it may affect their emotions, so be sure to let your stream of words flow with waves of gentility. If you ground yourself with spirit your thoughts and words will reflect an internal harmony. Enjoying more fresh fruit and vegetables, to start your day and end your evening with natural nutrients, will help you feel more alert and well rested. Pisces: The creative spirit is strong now. Though you may not trust your logic and feel a bit out of tune with the process in the beginning, you’ll find your balance once you get going. A vision board that is built on your hopes, dreams and inspiration will keep momentum going. You’re healing karma now, even if you aren’t fully conscious of how. Now you don’t need to worry about that. Just take your time, be gentle with yourself and enjoy feeling your life force. Put your feet in the water and soon enough you’ll feel like swimming. The beauty of a thriving coral reef is inside you. 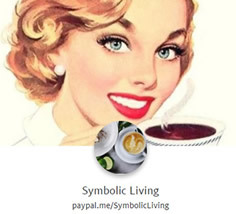 Follow us on Twitter @symbolicliving for more related tweets. This forecast has been written by Symbolic Living. © 2013. All rights reserved. This article is not to be copied or republished without express written permission.